Fans of Ghost Rider may still be wary of the character&apos;s cinematic future after his 2007 blockbuster debut was a certified dud, but 2012&apos;s sequel, Ghost Rider: Spirit of Vengeance, looks to bring a new direction to the character, and add some much needed comic book action and violence to the property. Over the weekend, Spirit of Vengeance received positive buzz after the film&apos;s trailer was shown at Comic-Con, but for those who didn&apos;t see the footage, The Film Stage has debuted the first pictures from the flick. 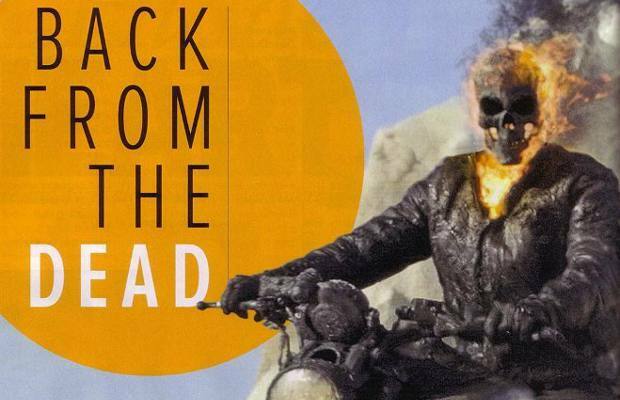 The pictures are scanned from the latest issue of Empire Magazine and they show off the newly redesigned Ghost Rider, complete with charred skull and a new bike. Also, Nicolas Cage seems to be sporting a less ridiculous looking rug on his head as well. Ghost Rider: Spirit of Vengeance will be released on February 17, 2012 and will be directed by Mark Neveldine and Brian Taylor, with Cage returning in the role of Johnny Blaze.